Read the blog of High Point, Winston-Salem, Greensboro wedding photographers Glessner Photography for recent weddings and photoshoots, advice for clients and brides-to-be, photography tips, and more. A few months ago, I had the honor of helping my industry colleague Kerri create and launch her new brand, Kerri Leigh Weddings + Events. In the midst of creating a business that was a true reflection of her, we came up with the idea to plan an inspiration shoot. We had a fabulous team of vendors come together to create something awesome, and today, I am thrilled to have that shoot featured on Every Last Detail. Check out the feature here! So many wonderful shop owners from Etsy contributed to this project and many of them were kind enough to donate their items to be used in one grand giveaway worth more than $500. Enter below for a chance to win one of 10 awesome prizes... you have two weeks to enter and share with your friends, and winners will be announced June 13, 2014. Be sure to leave a blog post comment with the top 3 items you'd like to win from the slideshow below in order for your entry to be counted! If you live in or are getting married in North Carolina, be sure to check out part two of our giveaway, and enter to win more than $800 in prizes from our local contributors! 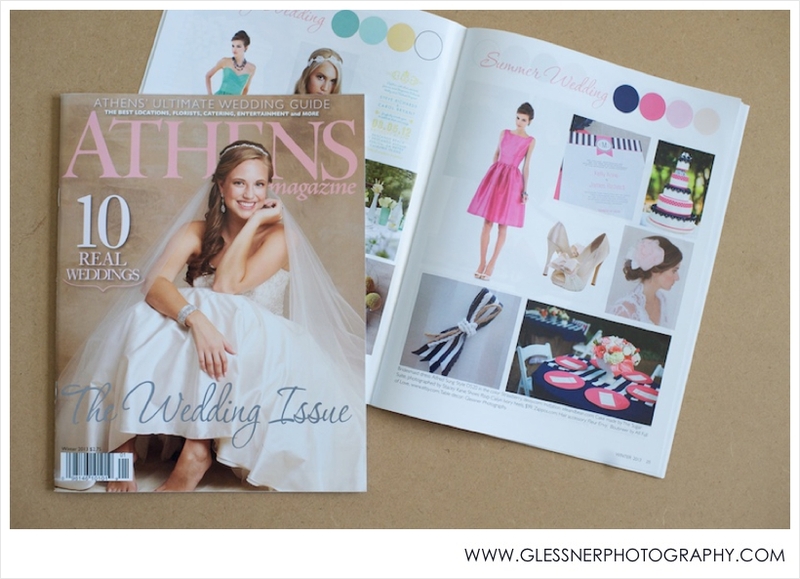 It's always a delight when you get to see your photographs in a print publications, so I was exceptionally excited to find in my mailbox this afternoon the latest wedding edition of Athens Magazine, a Georgia local publication. A designer for the magazine contacted me a couple of months ago to ask permission to use a photo from this Nashville styled shoot I shot back in 2011 in their Summer color palette inspiration section. Many thanks to Lauren at Athens Magazine for featuring our work! Last week, I had the pleasure of working once again with my one of my favorite Nashville-based wedding coordinators, Liz from CHIC Weddings and Events, on a Jackie O. inspired stylized wedding shoot I'd been dreaming of for months. MONTHS. It all started when I discovered this little number on Rent the Runway, and I just knew it was meant to be. (By the way, brides, this is a fantastic place to get a cute little rehearsal dinner wardrobe or a short and sassy white party dress for your reception). So when I found out I was going to be travelling back to Nashville for theFix, I called up Liz and she SO got my vision. To see more Glessner Photography real weddings, visit our gallery. Like what you see? We'd love to be your wedding photographers! Send us a line and let's have coffee.